The National Reined Cow Horse Association is pleased to announce that its first Premier Event of 2014, the Celebration of Champions, will be held at the world-class Will Rogers Equestrian Center in Fort Worth, Texas, February 14 – 22, 2014. “One of our primary goals for growth in the NRCHA is increased participation at our Premier Events. We anticipate that the appeal of Fort Worth and the Will Rogers Equestrian Center, along with the convenience of the new date later in February, will substantially increase the number of entries at the Celebration of Champions next year,” said NRCHA Executive Director Jay Winborn. In previous years, the Celebration of Champions schedule had overlapped the popular Arizona Quarter Horse Association Sun Circuit show and Super Bowl weekend. “Moving the Celebration of Champions date to mid-February was a well-received schedule change which allows competitors to attend both the Sun Circuit and the Celebration of Champions,” Winborn said. Established in 1988, the Will Rogers Equestrian Center hosts some of the most prestigious equine events in the world, including the National Cutting Horse Association Futurity. The complex includes 843 permanent stalls, with the ability to increase to 2,200 stalls during large events. The center is comprised of several arenas and buildings, including a 215,000 square foot building containing the 1,946 seat John Justin Arena and the 640-seat West Sale Arena. 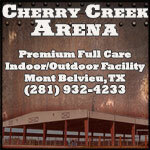 The Moncrief Building opened in 1996; it houses the 1,100 seat Watt Arena and space for up to 650 cattle or 260 horses. The Will Rogers Equestrian Center’s location in family-friendly Fort Worth, known as “the City of Cowboys and Culture,” adds to the NRCHA Celebration of Champions event appeal. Fort Worth is one of the largest cities in Texas and the 16th-largest city in the United States. It offers a world-renowned cultural arts district, rich Western heritage and major league sports. The Fort Worth Zoo is one of the top zoos in the nation, and other nearby recreation includes the Rangers Ballpark, Cowboys Stadium, Texas Motor Speedway and Six Flags. “Fort Worth extended a very warm welcome to the NRCHA, and we look forward to an unforgettable Celebration of Champions in 2014,” Winborn said. The Celebration of Champions includes a Derby for 4- and 5-year-old reined cow horses, as well as the World Championship Show, featuring the top qualifying horses and riders from the NRCHA’s eight geographic regions. Those riders will compete for World and National Championships in twelve different divisions. Another Celebration of Champions highlight is the World’s Greatest Horseman, This thrilling and prestigious event is a grueling four-event contest. One horse and one rider compete in herd work, reined work, roping and fence work. Ron Emmons and Olena Oak are the 2012 and 2013 NRCHA World’s Greatest Horseman Champions. The World’s Greatest Horseman competition moves to Fort Worth, Texas, in 2014. Celebration of Champions schedule information and entry forms will be available later in the year at www.NRCHA.com. The NRCHA has also signed an agreement to keep the Hackamore Classic at the Colorado State Fairgrounds in Pueblo, Colo., for 2014 and 2015. The NRCHA Hackamore Classic was first held at the charming Colorado State Fairgrounds in 2012. This Premier Event showcases the second stage of the traditional California Vaquero training style. Four- and five-year-old horses are shown in the hackamore, the bit-less headgear consisting of a braided bosal noseband and horsehair mecate rein. Horses are shown in herd work, rein work and fence work, with single go-round determining the Champions in nine Open and Non-Pro divisions. The 2013 event paid out more than $141,000, and featured two full slates of NRCHA -approved horse show classes. The entertainment value is high at the Hackamore Classic, offering a free Friday night dinner with drinks and live music, sponsored by numerous members of the Pueblo community. The event also features a fun, rough-and-tumble Stray Gathering competition. 2013 NRCHA Hackamore Classic Champion, A Spoonful O Sugar, shown by Chris Dawson and owned by Cryin Coyote Ranch.